W.F. 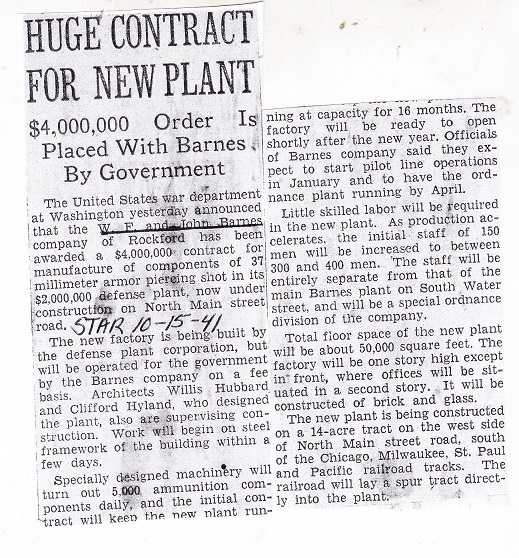 and John Barnes Co.
General, Manufacturer	10 percent surtax, Alan C. Mattison, Barber-Coleman Co., Belvidere Products, Bruce E. Horst, Business Leaders Expect Good Year, D. F. Laughlin, Dean Todd, Elco Tool and Screw Corp., Green Giant Co., J. L. Clark Manufacturing Co., James W. Ethington, John P. Kasper, John R. Sommer, L. D. Clay, Mattison Machine Works, National Lock Co. Diivision Keystone Consolidated Industries Inc., Nixon administration, Northwestern Steel and Wire Co., Robert L. Schaffer, Russell C. Gibson, Sundstrand Corp, T. R. Hennessey, Vietnam War, W.F. and John Barnes Co.
Events, General, Manufacturer	1939, 200 American firms represented, 7 Local Firms to Exhibit, also Russia, Barber-Colman Co., busier than ever since 1937, Cleveland machine Tool Show, Cleveland Ohio, export to France and England, Greenlee Bros and Co, Hugo Olson, Ingersoll Milling Machine Co., Machine Tool Exposition, Mattison Machine Co., National Machine Tool Builders Association, Rockford Machine Tool Co., Sundstrand Machine Tool Co., W.F. and John Barnes Co. 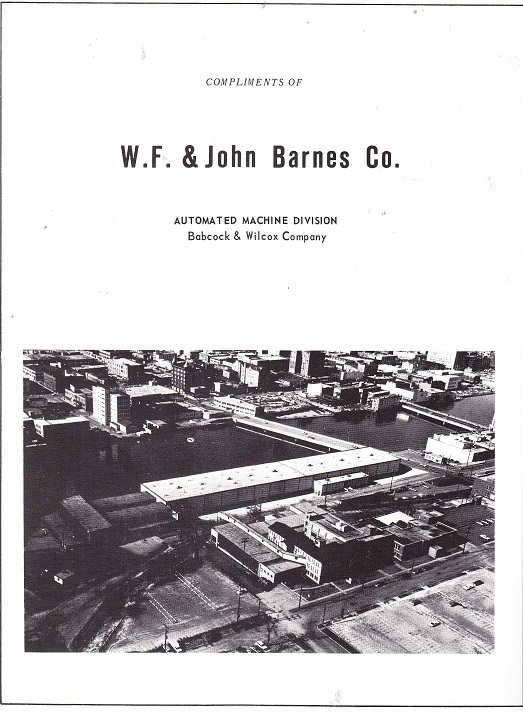 Addresses, General, Manufacturer	1971, 325 S. Madison Ave., Automated Machine Division, Babcock and Wilcox Co., W.F. and John Barnes Co. 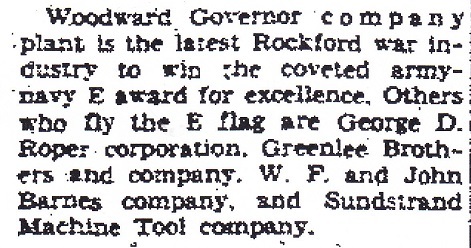 Addresses, General, Manufacturer	1970, 326 S. Madison St., W.F. 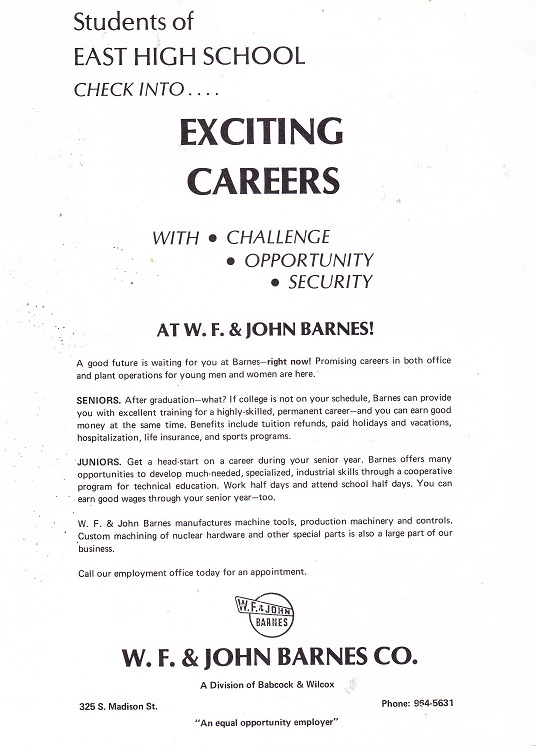 and John Barnes Co.